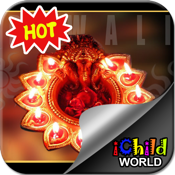 iChildWorld.com had recently ranked as 2011’s Top 10 Greeting Card Application Developer for iPhone and iPad. You are now FREE to choose your favorite unique design and send them to your loved ones. Halloween coming soon, got any dates yet with this special day coming? Not yet? Halloween a famous festive in the US is now coming alive! People are getting crazy and overjoyed. Wanna spend time with your love one? Have you SMS your love one or dream lover yet? or Have you greeted your buddies or family members? Have you send card to your friends that you haven’t meet up for some time? Err… may be you wish to send them one but you have no idea what to write in the card! According to research, people loved to receive greeting cards. They feel happy and appreciate when they receive greeting card. The receiver will even call you back or at least greet you back when they receive your greetings. Some even claimed that they had unforgettable date just because of sending a greeting card to their lover. You couldn’t imagine how powerful Greeting Card is until you experience it by yourself! The Major Reasons Why People Send Greeting Card? 1.Effective tools to communicate important feelings to people you care about. It keeps people connected and creates warm loving between individuals. 2.Receiver feels great receiving an unexpected greeting. People like to receive cards. They feels happy and it helps them to remember you if you send them one. 3.Greeting card as ideal option to send your caring and special message especially invitation for a party or a date with your adorer. 4.Images and words power in greeting card can help express our emotions. 5.Ideal for your friends and families staying abroad – it saves your stamps and mailing time. Just one click and your receiver will be getting it almost instantly! 6.On business, greeting cards enable business to build personal relationship with customer. They will refer to their friends and family if they satisfied with the service. It helps create positive word of mouth – the most inexpensive advertising method. Why Choose iChild World Greeting Card? 1.2011 Top 10 Greeting Card Application Developer for iPhone and iPad. 2.Have been making greeting cards for 5 years and continuously update with new designs. 3.A range of best quality unique designs from experts. We design the creative and wording for your cards. 4.Personalise and awesome greeting cards for friends and family via technology in conjunction with Electronic era. 5.High quality, satisfying greeting cards look just like real cards. 6.Can be customised according to user preference and drop a mail to people you care about. 7.Free to include own messages, photos and graphics of own choice. 8.Have been making greeting cards for 5 years and continuously update with new designs. 2.Best compatible with iPhone 4, 3GS, 3G, iPad2, iPad, iPod Touch. 3.Tailor to suit and compatible with brand new iPhone4S.